Inspired by Mimic (1997) and Richard Feynman's talks about Cargo Cult Science. Special Containment Procedures: All known instances of SCP-3035 are contained in Site-173 (a decommissioned Foundation site). Site-173 has two entry points: Entry A and Entry B. Entry A, the primary entrance, has been buried beneath 4 meters of concrete. Entry B, a vacuum-tube transit system, is used for deliveries to and from the interior of Site-173. MTF Nu-13 ("Rasczak's Roughnecks") is to maintain a provincial base at Entry B. They are to terminate any instance of SCP-3035 on sight. Approximately once a week, a package will emerge from Entry B's vacuum-tube system. Typically, this package will contain various non-anomalous materials (see below). Each package is to be placed in quarantine, where it is to be examined, documented, and then incinerated. Entry into Site-173 is prohibited until further notice. Description: SCP-3035 is a strain of Periplaneta americana (American cockroach, or water-bug) that mimics the behavior and outward appearance of organisms it observes. This mimicry is superficial. For example: While an instance of SCP-3035 may reproduce the coloration and behavior patterns of bumblebees, they will not reproduce a bee's complex social network or unique form of communication. Instances of SCP-3035 will mimic each other more rapidly than other organisms. This leads to a feedback loop: One instance will adopt a new attribute, only for all other instances to immediately mimic the first instance, acquiring the attribute for themselves. It should be emphasized that this mimicry is only a shallow approximation — an attempt by some as-of-yet unknown process to 'look' and 'act' like something else. 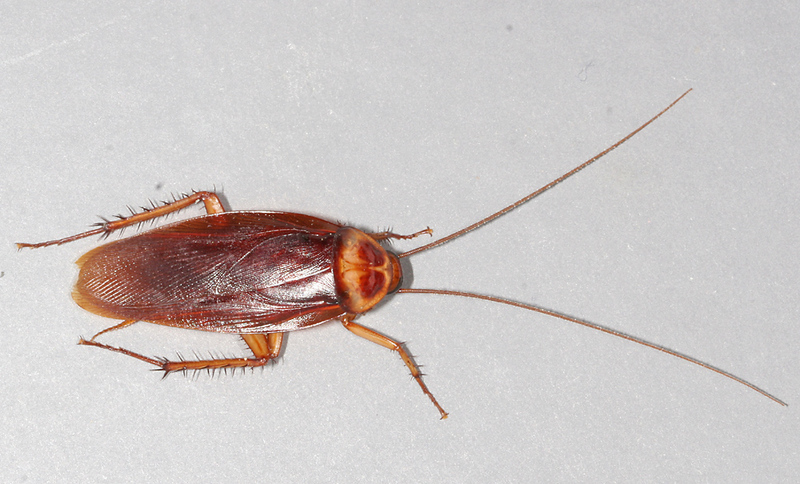 Regardless of the extent of this mimicry, instances of SCP-3035 still retain many of the characteristics associated with cockroaches. NOTE: Contents of sealed test-tubes not identified; presumed to be either sewage, blood, or both. NOTE: Legal pad contained illegible scribbles. NOTE: Roach eggs destroyed immediately as per procedure. We noticed something while finishing up with the latest batteries of tests. The SCP-3035 instances have adopted a new behavior — they'll stand along the edge of their enclosure, 'tapping' their forelegs against the glass. We're not sure where this behavior came from; it's not something exhibited in any of the insects we're training them to mimic. We figured it out. They're mimicking me. Nearly every day, I've been sitting down besides their enclosure, starting up my computer, and tapping away at the keyboard for twenty minutes. And now they've adopted my behavior — 'sitting up' and 'typing' at the glass. We previously presumed these organisms only mimicked other insects; clearly, we were wrong. This ability appears to extend to any creature they can observe. SUBJECT: My New Research Staff? Per your suggestion, I've moved the enclosure to a spot where my 'colleagues' can watch my work with greater ease. They've proven to be very apt students — already, I've observed them mimicking the motions I make when I'm taking notes or preparing solutions for testing. I've even noticed a few of them flopping around in a rather clumsy attempt to walk. There's one other issue — they've gotten bigger. An increase of about 15%, according to my measurements. It occurred so slowly I didn't even think to measure them until I reviewed past footage and noticed the increase in size. Regardless, my new star pupils are starting to grow on me. All of them, all at once — it happened like magic. Yesterday, they were just thumping around clumsily, and today… I walk into the lab and find them all strolling about the enclosure. Like they own the place. Or… like a buzzing little classroom of pre-graduate students awaiting their Professor. The curious part is that every test I've performed on them still indicates that they have the intelligence of your basic, run-of-the-mill cockroach. They can mimic behavior, but they can't mimic understanding; they copy my actions, but they don't understand why I do something. Or even what something means. As an experiment, I found some doll-sized tables and chairs and placed them inside the enclosure. The props are far too large, but I was curious if they'll try using them. And, well… If you've ever wanted to know what a bunch of cockroaches sitting at an over-sized table, typing away at keyboards that aren't even there looks like… I've attached a video that should satisfy your curiosity. I even got one of them to 'drink' from a tiny toy coffee mug (case_of_the_mondays.png). Per your request, I performed a biopsy on their nervous system. I've sent the results to you — as you can see, there's no new growth, no new structures — they're still just cockroaches. Bizarrely large cockroaches that walk around. And type at empty desks. And pretend to drink coffee. I felt a little bad about killing one of them; it's hard not to think of them as my little pupils. Still, none of the others seemed to mind. They're all just happily strutting about, acting like nothing even happened. They killed one of their own. This morning, I returned to the lab only to find one of the cockroaches on its back atop of the table, dead. It had been somehow — sliced open and gutted. The other cockroaches were just strutting around like nothing was wrong. I reviewed the footage from yesterday. Last night, after I left, one of them pinned another one down on top of the table. It used what looked like… sharpened tips on its forelegs to cut it open. Then, it started methodically removing the still-living bug's fatty tissues. Like it was scooping up ice-cream. Once it was done, it sat at the table and started tapping away at the invisible keyboard again. Like it was taking notes and writing emails based on the results. They saw my autopsy, Dr. Xao. They saw it, and then they mimicked it. I think this experiment has gone on far enough. SUBJECT: Re: Where's your spirit of scientific inquiry? This experiment is over. I'm euthanizing the lot of them. After three disastrous attempts at a rescue mission, we're giving up. Every time we send a squad of soldiers down there, these things start adapting their behavior and appearance — becoming more and more aggressive. On top of that, they breed like… well, cockroaches. Nu-13 will be stationed at Entry B; they'll stay as long as they can and wait to see if anything human comes out. But as of this moment, I'm declaring Site-173 a lost cause. The decision regarding whether or not to deploy nerve-toxins to clear Site-173 of SCP-3035 instances is under review — particularly in light of the recent revelation that some of the human organs emerging from Entry B are fresh.